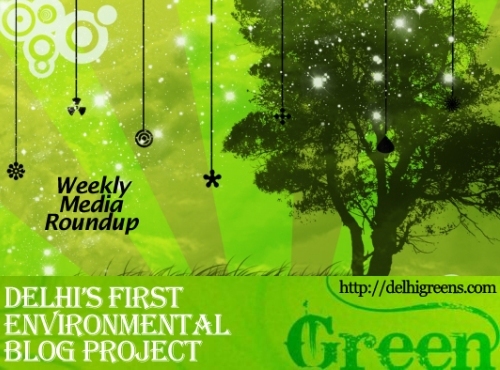 Weekly environmental news roundup from across different media networks for week 34 (starting August 20, 2012) 2012. In a first of its kind initiative by the civic body, the New Delhi Municipal Council has successfully disposed seven tonnes of electronic-waste in an environment friendly manner. Delhi’s bus rapid transit corridor is controversy’s favourite child. It invited a lot of publicity when the first and the city’s only such corridor was opened for traffic in April 2008. Four years hence, the debate on BRT’s suitability for a car-crazy city still rages. Poor show in Delhi may have earned the Bus Rapid Transit system the tag of an alien concept for India. But thanks to smart planning and implementation, the system in Ahmedabad has earned accolades from commuters as well as experts from India and abroad. Expressing serious concern over the increasing number of deaths among sewerage workers, the Delhi High Court has slammed the municipal corporations and the Delhi Jal Board for not providing even basic amenities such as full body suits to them. At least 40 sewerage workers died while working in the Capital in the last six months. The Ministry of Environment & Forests is implementing a Scheme to provide financial assistance for setting up of treatment, disposal and storage facility for hazardous and integrated recycling facilities for e-waste on public private partnership mode. Over 3.5 lakh BPL and poor families will get free LPG cylinders and gas stoves under an ambitious scheme launched by the Delhi Government today to end use of kerosene, which often does not reach the intended beneficiaries. The addition of 10,000 new autorickshaws on the roads in the next few months will benefit people travelling between Delhi and NCR towns the most. Delhi’s transport department officials said they will give out NCR permits to the drivers willing to take passengers to the satellite towns of Gurgaon, Noida, Ghaziabad and Faridabad. Poaching and a mysterious disease are killing peacocks, India’s national bird, in one of their richest habitats here in Uttar Pradesh. Residents of several colonies in the Capital were forced to wade through floodwater to move around on Saturday after hours of rain, even as traffic on major roads slowed down. When it gets ready for use early next year, Indira Paryavaran Bhavan in New Delhi will be the country’s first green building to have on-site generation of power to meet all its energy demands. To be the new address for the Union Ministry of Environment & Forests, it is a net zero energy building and also the first government-owned property with a target to be a five-star GRIHA and Leed Platinum rating building. In what could force Prime Minister Manmohan Singh to intervene in the raging debate on tiger versus tourism, Valmik Thapar, one of the most prominent tigerwallahs, has demanded that the Union government’s guidelines restricting tourism in breeding areas of big cats be discussed in the September 5th meet of the National Board of Wild Life , which is chaired by the PM and of which Thapar is an expert member. The Planning Commission’s attempt to rewrite the international and domestic obligations of the government on climate change in the 12th five-year plan, with a push for greater commitments to reduce greenhouse gas emissions, has miffed the environment ministry. A month after the Supreme Court relied on the government’s guidelines to ban tourism in core areas of tiger reserves, making popular destinations like Corbett National Park out of bounds for wildlife enthusiasts, the ministry of environment and forests on Tuesday did an about turn, telling the court that it needed to re-think the guidelines. The Union environment ministry’s eco-tourism guidelines, which promote community-based activities in the core of tiger habitats, could become a collateral victim of hectic lobbying from the influential tourism lobby. The Ministry of Corporate Affairs will soon come out with a sustainability reporting framework for companies to ensure that they follow certain parameters while meeting environmental challenges. Tourism minister Subodh Kant Sahai on Friday sought relaxation of rules to allow hotel construction within a 10 km radius of protected forests. The controversial statement comes at a time when the Supreme Court has slapped an interim ban on tourism in core of tiger reserve areas.